The retina is the light sensitive film at the back of the eye and retinal detachment is a condition where the retina peels away from the inner wall of the eye. In most cases the retina detaches because a hole or a tear has formed in the retina allowing fluid to pass underneath the retina. Most retinal detachments occur as a natural ageing process in the eye but certain people are at higher risk than others. These include people who are short sighted, those who have had cataract surgery in the past and those who have suffered a severe direct blow to the eye. Some types of retinal detachments can run in families but these are rare. The treatment involves surgery and the main aim of surgery is to seal holes in the retina and reattach the retina. The two methods used in retinal detachment surgery are vitrectomy or scleral buckle or a combination of the two. A vitrectomy involves removing the vitreous gel (that has caused the retinal tear) from inside the eye. Then to seal the tear the surgeon uses either laser or a freezing probe to make a scar around the tear. A gas or silicone oil bubble is then inserted into the eye to support the retina while it heals. A gas bubble slowly absorbs over 2 to 8 weeks but a silicone oil bubble will need a small operation to remove it at a later date. Your vision will be very blurred initially due to the presence of the gas or oil bubble. To use the gas or oil bubble to its best effect your surgeon may ask you to posture and this will be covered in a following section. The retinal holes can also be sealed and supported by stitching a piece of silicone rubber or sponge to the outside of the eye. This acts as a ‘splint’ and produces a dent within the eye and pushes the outer wall of the eye up to the hole in the retina. The buckle is not visible on the outside of the eye and usually remains in place permanently. With a gas or oil bubble in the eye your surgeon may ask you to posture after the operation for up to 10 days. Posturing involves placing your head in a specific position to allow the gas or oil bubble to float into the best position to support the retina. There are various posturing positions and your surgeon will advise you on the one appropriate to you. Posturing is often the hardest part of the recovery after surgery but is important and should be regarded as the second stage of the operation. You will be required to posture 45 minutes out of every hour during the day. The 15 minutes out of every hour when you are not posturing should be spent moving around or taking gentle exercise to relieve discomfort and general body ache. What anaesthetic is required for retinal detachment surgery? Retinal detachment surgery can be performed under local anaesthetic or general anaesthetic. Under local anaesthetic you will be awake but you will not feel any discomfort as the eye will be numbed with an injection. You will not see the operation and the other eye will be covered. If a general anaesthetic is chosen then you will be fully asleep. The decision as to which type of anaesthesia is most suitable will be made following a discussion between you and your surgeon. The most obvious benefit is preventing you from going blind in the affected eye. You may have lost vision already from the retinal detachment and even with successful surgery your vision may not return to normal. Retinal detachment surgery is not always successful. Every patient is different and some retinal detachments are harder to treat than others. Some patients may need more than one operation. These are the risks and benefits that will be explained to you before you give consent for surgery. 1. The success rate for retinal detachment surgery is approximately 90% with a single operation. This means that 1 in 10 people (10%) will need more than one operation. The reasons for this are new tears forming in the retina or the eye forming scar tissue which contracts and pulls off the retina again. 2. If a gas or oil bubble is used during surgery then you will usually develop a cataract in the eye within the first 18 months. A cataract is the lens of the eye becoming cloudy and will require a short operation to remove it. 3. Any surgical procedure carries a risk of haemorrhage and infection but in retinal detachment surgery this risk is very low (less than one in a thousand). Although it is rare, it does have serious consequences as it can cause blindness. Although retinal detachment surgery is a major operation, it is rarely very painful. It is normal to experience some discomfort in the eye after surgery but this usually relieved with simple painkillers such as paracetamol or ibuprofen. The white of the eye will look red and the eyelid may appear swollen following surgery. You may also experience some watering from the operated eye and a gritty sensation during the first month following surgery as any stitches gradually dissolve. The redness, eyelid swelling and watering will gradually improve. Vision in the operated eye will usually be very blurred for the first few weeks but will slowly improve. The final visual result may take several weeks or months and you may require new glasses. 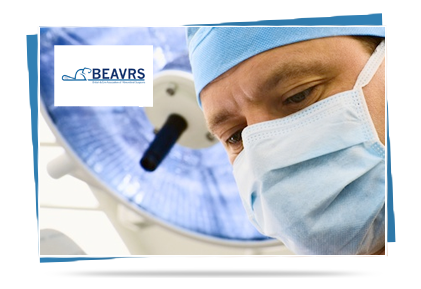 Your surgeon will discuss with you the expected final outcome of your vision. Will I need to instil eye drops after the operation? You will be given an eye drop to reduce inflammation (steroid drop), another to prevent infection (antibiotic), and sometimes additional drops to keep the pressure inside the eye within normal limits. You will be advised on how many times a day to use the drops before you leave hospital. Use the drops regularly until your first postoperative outpatient visit. You will then be given further instructions on how long the drops need to continue for. If you have been given any posturing instructions then these should be followed. You can bath or shower, but avoid splashing water near the eye. Generally you may do anything with which you are comfortable. Most people choose not to drive over the first few weeks. You must not fly until the gas bubble has gone and you must inform the anaesthetist if you require a general anaesthetic for any operation while there is gas in your eye. Most people will need at least two weeks off work after surgery. Sometimes this may be longer. While there is gas in the eye the vision is quite poor and the ability to judge distance is affected. The amount of time off work will depend on the kind of work you do and the kind of surgery that is done. This will need to be discussed with your surgeon. The advice in this booklet is based on a variety of sources, including latest research published in peer-reviewed scientific journals. It has also been scrutinized by a panel of experts from the Britain & Eire Association of Vitreoretinal Surgeons (“BEAVRS”). If you require further information about this, please ask your surgeon.